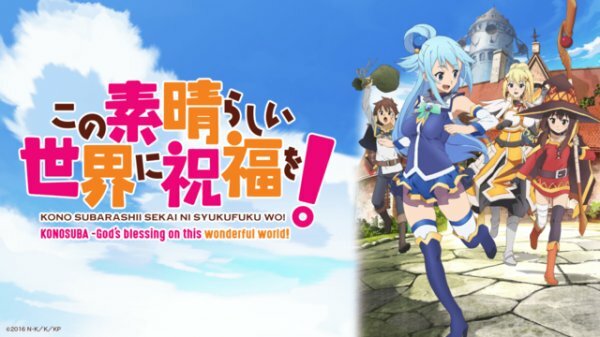 Konosuba is short for “Kono Subarashii Sekai ni Syukufuko Wo!”, which roughly translates to “God’s Blessing On This Wonderful World. It is an anime focused on an alternate reality that is in desperate need of heroes. Our hero, Kazuma Sato dies in a funny way and is given a choice, heaven or another world, he chooses the other world. Once there the series follows every noobs experience in an MMO without the respawn function, they join a guild and try to level up. This anime documents their adventures as they strive to get more powerful and defeat the Demon King. Kazuma is a typical shut in, with no particular skill set whatsoever. In the real world he lives alone and plays video games all day. His life is pretty uneventful, until he dies. His real journey begins when the goddess Aqua offers him two choices – Go to Heaven or go to another world which is in desperate need of a hero to defeat the Demon King. He dreams of becoming a great hero in this parallel universe, but makes a critical mistake in requesting a goddess instead of a powerful item or spell. In many ways his character is focused on mocking the typical anime set up, in this series Kazuma is an extremely average adventurer, no special stats or power. Instead it is his companion who is immediately set up as a hero with exceptional stats. Instead he has luck and lots of it, this influences his character throughout the series leading up to a series of hilarious and sometimes unfortunate events. For instance he takes down the town hero and nicks his sword with a basic steal ability, later he influences a crucial battle by accidentally stealing the Devil Kings General’s head. This character provides some much needed wit as he tries to make himself successful and deal with his allies. He is a character who is developed mainly through his comedy and despair as he attempts to level. If you want your humour then welcome to the worst type of ally. 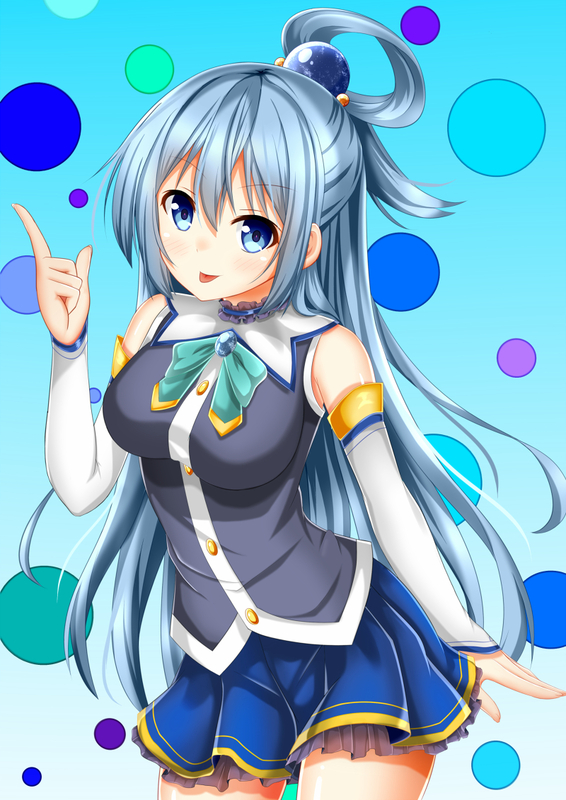 Aqua is extremely powerful with above average stats on account of her being a goddess brought into the world. The only stat she is lacking is intelligence and this makes itself abundantly clear, throughout the series she is determined to gain power but spends all of her points on spells that serve as party tricks. This also makes her extremely careless with money, leading to her constantly pleading with Kazuma to help her out. During combat this also manifests itself several times early on as she is routinely eaten head first by giant toads. Outside of her stupidity she struggles hard to adjust to life outside of the heavens with her new party, struggling at points with the limitations of her position. Despite this she works hard to protect her friends. With extremely powerful healing magic capable of resurrecting party members and doing massive damage to the Undead. Whilst we know little about her backstory she is a fun character, if sometimes worth despairing of. Darkness, (Lalatina Dustiness Ford) is the tank of the party and a huge masochist. Konosuba holds nothing back when using her masochism in the story for humour or as a plot device. 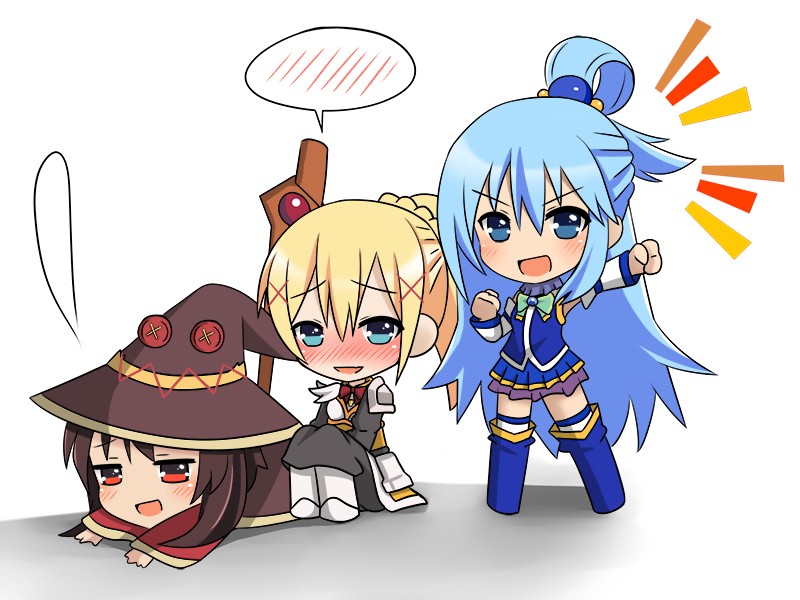 She joins the party after seeing the advertisement in the guildhall and hearing that they have run into danger and both Megumin and Aqua have been covered in slime. If you are new to Anime all I will say is this, you will have to get used to the sexual and even perverted humour to enjoy Konosuba. If it offends you then this probably isn’t the Anime for you as deriving pleasure from the abuse Darkness takes as a tank class is a large part of her character. The joke of course is that taking damage is all she is good at, the catch is like Aqua, she isn’t perfect. 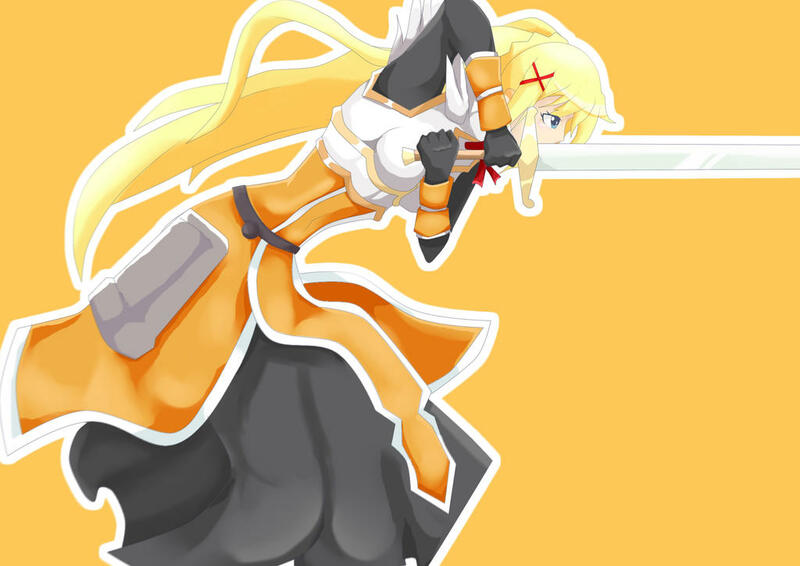 Darkness is clumsy and has no offensive capability whatsoever, she is even seen to miss static targets in combat. She is a fiercely loyal character whose skin isn’t always as thick as it seems, willing to go to great lengths to help her friends regardless of pain or humiliation. (though I would be lying if I said she didn’t enjoy both) She is revealed towards the end to be the daughter of the lands rulers and puts herself between a seemingly invincible mechanical fortress and her friends. Thus far Konosuba has given us a strong healer, a good tank and a track of all trades rogue all that is needed to complete this party is damage. Meet Megumin, quite literally the nuke of the party. As a practitioner of high level explosion magic she makes up the bulk of the parties damage. The catch she can only use it once per day. Anyone who has played MMO’s has been there, that one player who puts all of their points into a single powerful ability they can’t use often instead of reliable damage. 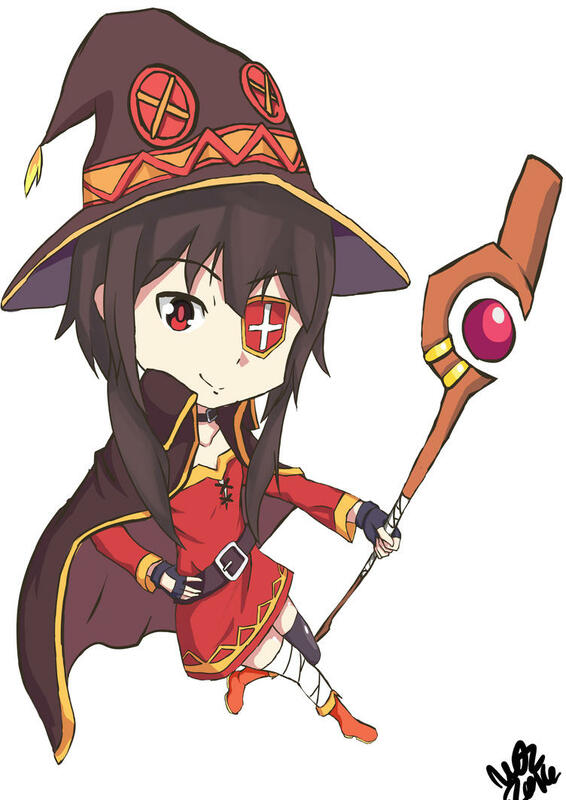 Megumin is perhaps the most one dimensional of all the characters, all we really know about her is that she is one of the Crimson Demons, a race excelling at destruction magic. All she cares about is blowing stuff up and her efforts are poured into this one and only goal whenever they can be. Despite this she is an adorable character, that like the rest of the cast will have you laughing out loud as you watch Konosuba. Wiz is a minor character. As a Lich and one of the Undead she is constantly at odds with Aqua. However for a Lich, a title that holds relatively negative connotations, she is not the main enemy. In the beginners city our Heroes find themselves in she is a hero, a high level individual that has set up shop there. Honestly, that is about all the development her character gets. I personally feel that she was heavily cut out of the show, the only attempt at her backstory comes in flashes and gives you the feeling you missed an episode. I went back and checked episodes for missing content, as did half the Crunchyroll comments section. Despite her lack of development she is undeniably important as she turns up for the ‘Final boss’ fight and launches massive spells one after the other. 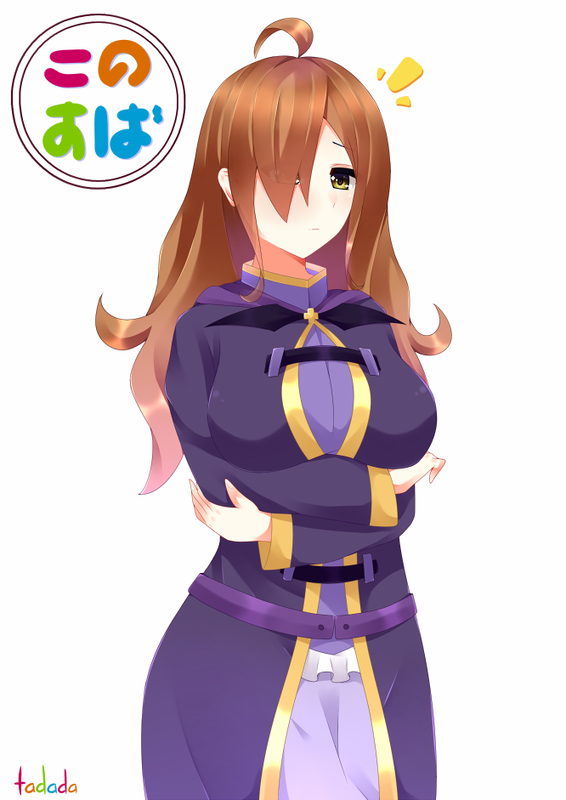 I feel like Wiz is a missed opportunity for Konosuba and hope they will give her a little more focus in future seasons. Whilst I was critical of Megumin being a slightly one dimensional character this can sadly be said for most other characters as well. This is largely down to the fact it was only a ten episode season, there wasn’t much time for them to develop characters. That said they did make an effort to develop Kazuma, at one point offering him the chance to return to Japan and live as a part of an affluent family. This forces Kazuma to decide what he values more, his new friends or comfort in his original world forcing his character to grow. 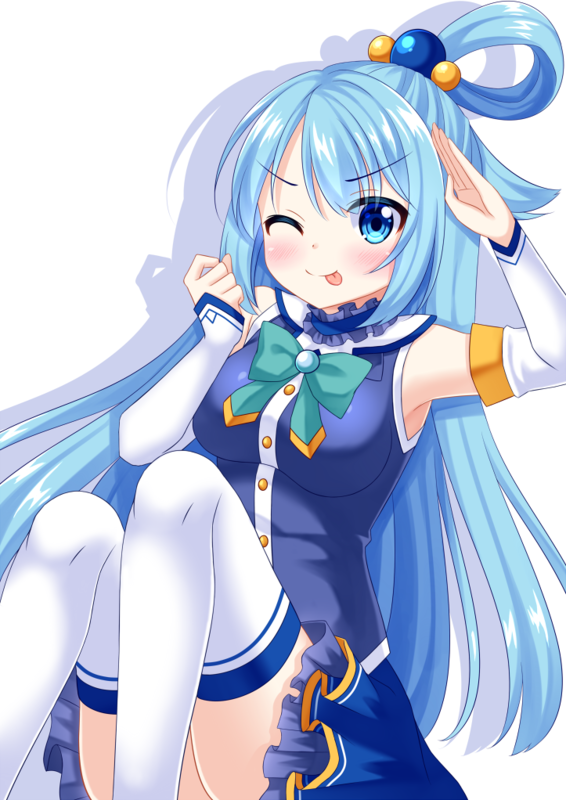 The best thing about the art style for Konosuba is the colour. Not only are the characters vibrant in their differing gear like Aqua’s blue and Megumin’s Red, but the effects given to spell casting are some of the best I have seen in anime. 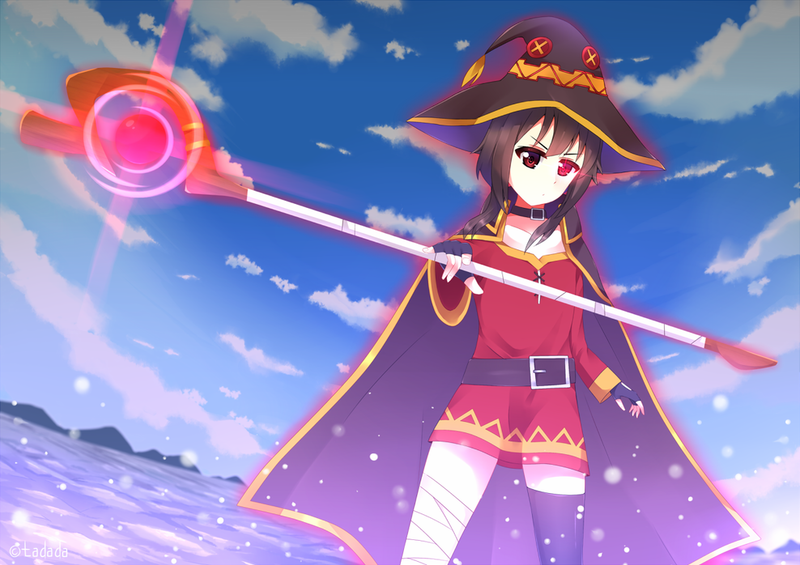 Some of my favourite moments in Konosuba were focused on Megumin or Wiz casting an explosion. The colour palettes were well chosen to mirror disciplines, with the typical warm yellows and light being used to represent faith and darker colours for undead magic and so on and so forth. Unfortunately some of the art seems to be fairly whimsical in what it shows, with some of the scenes having detailed back drops and others being simplistic and cartoonish, due to the nature of the show however this isn’t something that in anyway influenced my opinion as it only came to my attention upon re-watching Konosuba. In my opinion the story is the area that Konosuba has really struggled with, there just isn’t much of it. This is something the game developers seem to acknowledge throughout, they use Kazuma’s knowledge of games to tell the audience there will be more. Comments such as, “that was one long tutorial put the anime in its place.” In many ways that is what the series represents, the setting of the stage and the first quests of any game. Whilst enjoyable I personally would have liked to see some more plot progression in the episodes. I can however see that with the Anime being largely focused on comedy, slowing it down to put more comedic situations in the form of side quests was likely a deliberate decision. What there is a decent amount of in the story is game style story development, for instance as with the start of party based games the tutorial introduces you to companions. There were some small twists in the story such as Darkness’s heritage, Megumin’s bombarding of an empty castle that wasn’t empty, the destroyer fortress. However if you look at the series as it tells you to, – as a tutorial, then these events make sense: You join a guild, increase your party size, go questing for exp, kill the mini boss and then the main boss, first town of your MMO complete. This is no bad thing in and of itself but it does suggest that future series may have more in the way of story, but follow a similar story line. In short if you like MMO story telling in a more visual format you may feel there isn’t anything lacking here, however as a visual and less interactive art form I would have preferred a little more substance to keep me gripped. Last on the list is music, one of the big deciding factors in whether an Anime is worth your time. The sound track to Konosuba is light, playful and fully representative of the on screen events. Going from dramatic, as Aqua hits a giant toad to bouncy as it all goes wrong. My main criticism is that the soundtrack can feel repetitive, most of the comedy has the same tune in the background. I don’t think this is is a huge issue, other Animes such as Shiki us the same tunes repeatedly to great effect. Does it enhance the experience? The short answer, yes it does. My rating for season one of Konosuba is a Seven out of Ten. This anime was extremely funny and I really enjoyed some of the visuals and game style story telling. I do however think that the Anime suffered heavily from a lack of episodes and plot that extended beyond a tutorial style narrative. If you enjoyed this review or have a different opinion I would love to hear it in the comments section below. Previous Previous post: The Kingkiller Chronicle: Why you should be reading it.